The procedure of upper eyelid blepharoplasty has changed dramatically in both understanding and performance over the last 20 years. Upper eyelid overhang and the resultant tired facies have led patients to seek correction for the last century. Understanding the dynamic anatomy of the upper eyelid and the palpebral crease allows tailoring the fold and eradicating the tired look in most patients. Given proper brow position (see Brow Lift, Periorbital Rejuvenation), the upper eyelid blepharoplasty is a mainstay of surgical rejuvenation of the orbital region. [1, 2] See the image below. Preoperative view of patient who underwent previous brow lift and laser resurfacing of the entire face. The patient did not like the upper eyelid overhang and desired well-defined folds without exaggeration. Upper eyelid skin resection and fat resection from the 2 upper eyelid fat pockets have been performed for more than a century. In the last 20 years, skin and fat resection has decreased to avoid causing incomplete eyelid closure and dry eye symptomatology. A deeper understanding of the dynamic nature of the upper eyelid has led to invagination techniques, largely borrowed from the Asian double-eyelid procedure, to deliver a crisp upper eyelid fold at a height that is optimum for the patient. Upper eyelid blepharoplasty is the surgical approach to addressing dermachalasis (also known as dermatochalasis) of the upper eyelid. Dermachalasis represents redundant, loose skin of the upper eyelid that occurs with aging. Clearly differentiate upper eyelid dermachalasis from the myriad other problems of the upper eyelid that often are a component of upper eyelid aging. True dermachalasis is common, but often, all upper eyelid problems are treated with upper eyelid skin blepharoplasty, which is useful only for treating dermachalasis. Even with this problem properly diagnosed and differentiated from other periorbital problems, a better treatment is often found with an anchor blepharoplasty compared to simple skin resection or skin and partial muscle and fat resection. Brow ptosis is the most common cause of upper eyelid fullness. Carefully assess brow position prior to planned rejuvenation of the periorbita. Please see the Medscape Reference text on brow lift (Periorbital Rejuvenation Brow Lift) for a more detailed discussion of this topic. Aggressive treatment of the upper eyelid for the treatment of brow ptosis is inadequate and counterproductive and rarely leads to any marked improvement in the condition. Upper eyelid ptosis also commonly is mistaken for upper eyelid dermachalasis and cannot be treated with simple upper eyelid blepharoplasty or anchor blepharoplasty. Repair the dehiscence or shortened levator muscle in individuals with good levator function but acquired or congenital ptosis. If ptosis requires correction, perform an anterior or posterior procedure (Fasanella-Servat or partial Mullerectomy to preserve conjunctival mucus-secreting glands). The differentiation of low fold, lack of fold, and lacrimal gland ptosis and changing dogma in the treatment of upper eyelid fullness are discussed. Given sufficient time to age, essentially all individuals develop apparent upper eyelid skin excess. 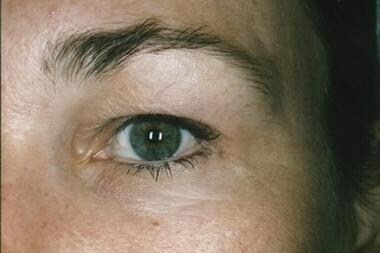 As mentioned above, differentiate this from numerous other conditions that add to the aged appearance of the upper eyelid. An upper eyelid fold is present in approximately 50% of Asian patients, and this is often viewed as a more beautiful Asian visage than the heavy upper eyelid appearance of those born with no fold. In many instances, individuals are born with a fold that attenuates with time such that it becomes uneven or lacking. The object of upper eyelid fold procedures in Asian patients is not to create a more Caucasian-looking eye with a high eyelid fold. The goal is to create a more beautiful Asian eye, often with a low fold but without the excessive heaviness of the upper lid often present in those with no fold. The etiology of upper eyelid deformity is related intimately to the anatomy of the area (for more information, see Eyelid Anatomy ). Weakening of connective tissues, loss of skin elasticity, and the effects of gravity over time all contribute to the development of dermachalasis. Loss or lowering of the palpebral crease is caused by failure of the skin-adhering bands of the levator aponeurosis to cause folding of the skin. The conjoined tendon from the orbital septum and levator inserts bands into the skin, which results in the upper eyelid fold. This is a dynamic fold that is not present in the closed eye. In the Asian patient born without a fold, these attachments are not present or are weak, allowing preaponeurotic fat to fall beneath the skin, leading to the observed fullness. This also occurs in individuals with septal fat ptosis. The correction of both of these conditions involves creating a direct, dynamic connection between the conjoined tendon and the upper eyelid skin—the anchor blepharoplasty. Steatoblepharon is also frequently seen in association with dermachalasis, representing herniated orbital fat visible beneath the eyelid skin secondary to weakening of the orbital septum. Septal fat ptosis and ptosis of the lacrimal gland in the upper lateral area of the upper eyelid are caused by weakening of the retaining ligaments and septum. See Etiology for more information. As the aging process affects everyone, calling it pathologic is semantically incorrect. In an Asian patient with an upper eyelid lacking a fold (congenital), often some degree of medial epicanthus also is present. The degree to which the medial epicanthus is hidden by the epicanthal fold determines whether correction is necessary. Medial epicanthoplasty is discussed in Treatment, but a small median epicanthus is also an ethnic trait, and complete removal in all instances can markedly change the appearance of the individual. Clearly discuss this preoperatively and plan the degree of correction if necessary. The primary indication for upper eyelid blepharoplasty is the patient's desire to improve his or her appearance. In rare instances, upper eyelid skin occludes peripheral vision, and some insurance carriers are willing to contribute to operative costs to improve the condition after visual field examination and mapping are performed. Rarely, a component of brow ptosis is absent in these patients. The indications for upper eyelid procedures in the Asian patient merit further discussion. The intent of the procedure is to create a more beautiful Asian eye, not to create a Caucasian-appearing eye. The author has had parents bring in 5-year-old children for the procedure, and, although he declined to perform the procedure, the author believes individual practitioners should decide whether they consider this a congenital defect or a cosmetic variance. A discussion of anatomy is important. The change in how this procedure is performed was caused largely by a better understanding of anatomy through the dissection of fresh versus preserved cadavers. Understanding the 4 layers that contribute to the fascial framework of the upper eyelid is imperative. The first, the orbicularis (superficial) fascia, is immediately beneath the skin and orbicularis muscle. The orbicularis muscle acts as the sphincter for the palpebral fissure. It must slide over the orbital septum. This fascia is elastic, and grasping it at surgery actually can lower the brow and lower forehead. Just deep to this is the inelastic orbital septum. This second layer is the deep fascia of the upper lid and acts to retain the orbital fat. It is continuous with the periosteum of the orbit. It joins with the levator aponeurosis to form a sling for the orbital fat. The third layer is the levator aponeurosis, which is deep to the fat pad. Some patients have varying amounts of fat in each layer; use the fascia in anatomic place finding. The main function of the levator is to elevate the lid, but it has attachments to each layer of the lid and a direct connection to the pretarsal (conjoined fascia), which is the last layer. This layer is spread thinly on the face of the tarsus and is the attachment for both the orbicularis muscle and the levator palpebra muscle. Thus the orbital septal fascia and the levator aponeurosis join in a conjoined fascia a variable distance from the tarsus. A number of anatomic differences exist between an Asian patient's upper eyelid, which does not have a fold, and a Caucasian patient's upper eyelid. The levator aponeurosis/conjoined fascia extensions to the skin tend to be weak or nonexistent. The preaponeurotic fat pad tends to be thicker. Trichiasis often is present because of the constant downward force on the eyelashes from the overhanging upper eyelid skin. The skin also can be thicker, occasionally because the patient used tiny pieces of tape to form a fold and constantly irritated the skin. No contraindications exist to a properly conceived and performed upper eyelid blepharoplasty in the typical patient. Approach lagophthalmos with caution, since no skin should be resected, but other corrections can be performed with the procedure. Multiply operated upper lids can present a formidable challenge to those inexperienced with the changing anatomy from previous surgery. The patient's attitude and expectations must be appropriate and reasonable. The patient's general health is always a consideration, but the procedure is minimally invasive, and, when performed alone, it can be performed readily with local anesthetic unaugmented by sedatives. Kwitko GM, Patel BC. Blepharoplasty, Ptosis Surgery. 2018 Jan. [Medline]. [Full Text]. Sayoc BT. Surgery of the Oriental eyelid. Clin Plast Surg. 1974 Jan. 1(1):157-71. [Medline]. Millard DR Jr. Aesthetic aspects of reconstructive surgery. Ann Plast Surg. 1978 Nov. 1(6):533-41. [Medline]. Fernandez LR. Double eyelid operations in the Oriental in Hawaii. Plast Reconstr Surg. 1960. 25:257. Flowers RS. Upper blepharoplasty by eyelid invagination. Anchor blepharoplasty. Clin Plast Surg. 1993 Apr. 20(2):193-207. [Medline]. Siegel RJ. Essential anatomy for contemporary upper lid blepharoplasty. Clin Plast Surg. 1993 Apr. 20(2):209-12. [Medline]. Chen WP, Park JD. Asian upper lid blepharoplasty: an update on indications and technique. Facial Plast Surg. 2013 Feb. 29(1):26-31. [Medline]. Macdonald KI, Mendez AI, Hart RD, Taylor S. Eyelid and brow asymmetry in patients evaluated for upper lid blepharoplasty. J Otolaryngol Head Neck Surg. 2014 Oct 2. 43 (1):36. [Medline]. [Full Text]. Weissman JD, Most SP. Upper lid blepharoplasty. Facial Plast Surg. 2013 Feb. 29(1):16-21. [Medline]. Scawn R, Joshi N, Kim YD. Upper lid blepharoplasty in Asian eyes. Facial Plast Surg. 2010 May. 26(2):86-92. [Medline]. Jeon MS, Jung GY, Lee DL, Shin HK. Correction of Sunken Upper Eyelids by Anchoring the Central Fat Pad to the Medial Fat Pad during Upper Blepharoplasty. Arch Plast Surg. 2015 Jul. 42 (4):469-74. [Medline]. Pool SM, Struys MM, van der Lei B. A randomised double-blinded crossover study comparing pain during anaesthetising the eyelids in upper blepharoplasty: First versus second eyelid and lidocaine versus prilocaine. J Plast Reconstr Aesthet Surg. 2015 Sep. 68 (9):1242-7. [Medline]. Greco M, Vitagliano T, Fiorillo MA, Greto Ciriaco A. A New Technique of Upper Eyelid Blepharoplasty Using the Orbicularis Muscle Flap. Aesthetic Plast Surg. 2011 Jun 15. [Medline]. Saalabian AA, Liebmann P, Deutinger M. Which Tissue Should Be Removed in Upper Blepharoplasty? Analysis and Evaluation of Satisfaction. World J Plast Surg. 2017 Sep. 6 (3):324-31. [Medline]. [Full Text]. Postoperative view after anchor blepharoplasty of the same eye. Note the remaining fullness of the lateral upper lid area, considered by many to be a sign of youth. Preoperative view of the opposite eye in a patient who underwent previous brow lift and laser resurfacing of the entire face. The patient did not like the upper eyelid overhang and desired well-defined folds without exaggeration. Postoperative view in a patient who underwent previous brow lift and laser resurfacing of the entire face. The patient did not like the upper eyelid overhang and desired well-defined folds without exaggeration.